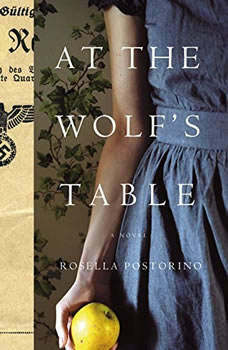 At the Wolf's Table is a moving audiobook based on the untold true story of the women conscripted to be Hitlera€™s food tasters, from internationally bestselling author Rosella Postorino. "They called it the Wolfsschanze, the Wolfa€™s Lair. 'Wolf' was his nickname. As hapless as Little Red Riding Hood, I had ended up in his belly. A legion of hunters was out looking for him, and to get him in their grips they would gladly slay me as well." Germany, 1943: Twenty-six-year-old Rosa Sauera€™s parents are gone, and her husband Gregor is far away, fighting on the front lines of WWII. Impoverished and alone, she makes the fateful decision to leave war-torn Berlin to live with her in-laws in the countryside, thinking shea€™ll find refuge there. But one morning, the SS come to tell her she has been conscripted to be one of Hitlera€™s tasters: three times a day, she and nine other women go to his secret headquarters, the Wolfa€™s Lair, to eat his meals before he does. Forced to eat what might kill them, the tasters begin to divide into The Fanatics, those loyal to Hitler, and the women like Rosa who insist they arena€™t Nazis, even as they risk their lives every day for Hitlera€™s. As secrets and resentments grow, this unlikely sisterhood reaches its own dramatic climax. Whata€™s more, one of Rosaa€™s SS guards has become dangerously familiar, and the war is worsening outside. As the months pass, it becomes increasingly clear that Rosa and everyone she knows are on the wrong side of history.